Canada has awarded Thales Canada the second phase of its Medium Earth Orbit Search and Rescue (MEOSAR) ground segment contract. The contract includes the procurement of two MEOLUTs and maintenance services for five years with options for an additional five years. “From complex C4ISR systems to integrated maritime C3 and diverse aerospace solutions, this contract further reflects Thales’ continued commitment to Canadian innovation,” said Jerry McLean, Managing Director and Vice President, Thales Canada. Using Thales Alenia Space’s MEOLUT Next phased array solution, Canada will leverage what Thales describes as the world’s first space-borne search-and-rescue system of this type. As opposed to using large parabolic antennas, Thales' MEOLUT Next solution measures less than six square metres, with the ability to track up to 30 satellites. Commissioned in 2016, MEOLUT Next is designed to detect distress signals more than 5,000 km away. MEOLUT Next will support Canada’s ability to respond to distress signals from land, air and sea from coast-to-coast-to-coast; enabling Canada to meet its obligations under the International COSPAS-SARSAT Programme Agreement. In announcing this Canadian contract, Thales provided an example of the system’s effectiveness based on a July 2, 2017, incident that took place 70 kilometres off the coast of Sardinia. At 6:30 am, a 12-metre sailboat with three people aboard triggered its COSPAS/SARSAT beacon when its rudder broke and its engine failed. With its VHF radio out of range, the sailors were in a critical situation facing waves more than four metres high and the wind blowing at 40 knots. 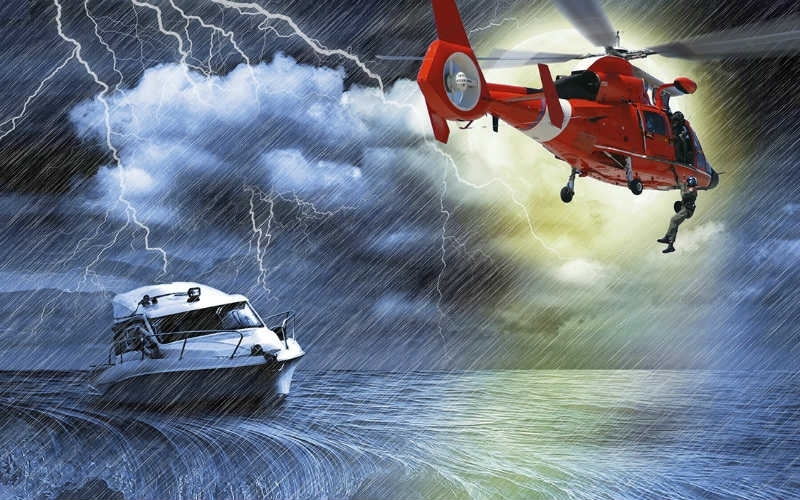 Thales explains MEOLUT Next was able to receive and process their distress signals in less than five minutes, providing accurate positioning to authorities. An airplane identified the boat less than two hours after the beacon was triggered and a helicopter airlifted the crew to safety, saving all three lives. “We are confident that our solution will meet and exceed Canada’s MEOSAR expectations… Today, MEOLUT Next is the only solution in the world capable of processing second-generation beacons in real time,” said Philippe Blatt, VP Navigation France at Thales Alenia Space. COSPAS/SARSAT is an intergovernmental organization founded by Canada, the United States, Russia and France. In operation in 43 countries around the world, this satellite-based search and rescue distress alert detection and distribution system is equipped on approximately 500,000 ships and 150,000 aircraft. Thales explains the COSPAS-SARSAT service has saved more than 37,000 lives.